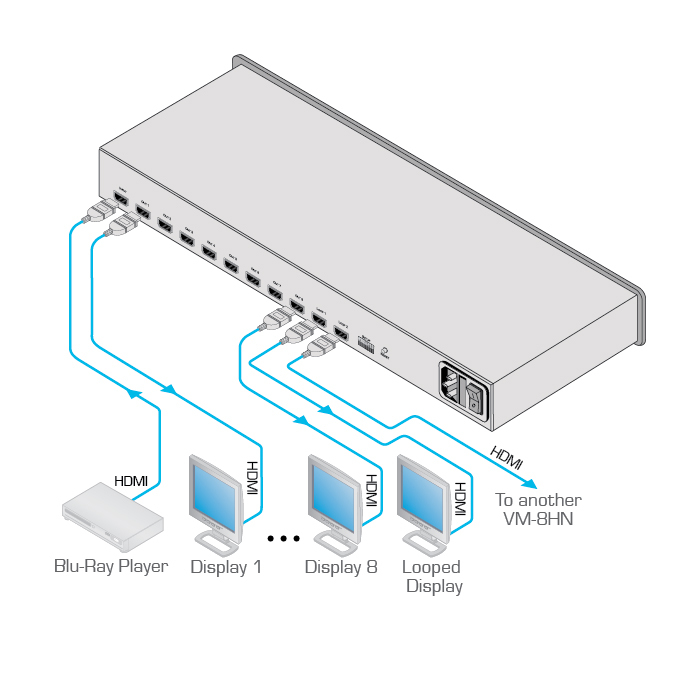 The VM-8HN is a looping distribution amplifier for 4K UHD HDMI signals. It reclocks and equalizes the signal and distributes it to eight identical outputs and two loops. It supports resolutions up to 4K@60Hz (4:2:0) UHD. Max. Data Rate - 10.2Gbps (3.4Gbps per data channel). HDMI Support - Deep Color, x.v.Color, HDMI Uncompressed Audio Channels, Dolby TrueHD, DTS-HD. Default EDID - For fast and efficient connection of the unit. Video Wall Support - Mutes the video on all displays and simultaneously unmutes them when all inputs are ready; with selectable output delay. Automatic 5V Turn Off - When no active input signal is detected, the unit turns off 5V on the output allowing attached devices to power off. MAC Settings - Enables and disables HDCP support on the input allowing the source to transmit a non-HDCP signal if required. Force RGB - Modifies the EDID saved on the input to support RGB format (i.e., not YUV format). 2 Looping Outputs - Allow monitoring and cascading to additional DAs.